Product prices and availability are accurate as of 2019-04-20 06:50:14 EDT and are subject to change. Any price and availability information displayed on http://www.amazon.com/ at the time of purchase will apply to the purchase of this product. Operating Vet Kit with open slot in operating otosocpe head that will allow for forceps use and retrieval of f oxtails and foreign bodies **NEW** for April 2013 Bright LED light. Perfect Kit for removing foreign bodies. 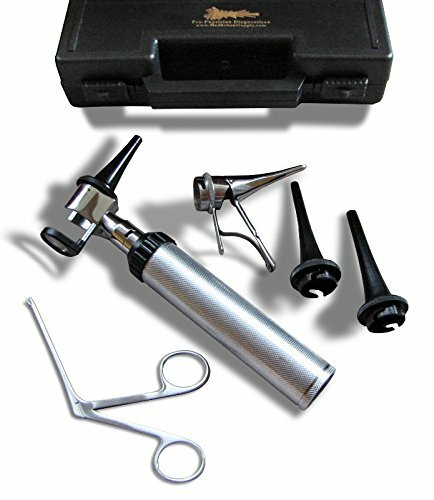 Absolutely one of the best values in a VETERINARY Operating Otoscope Sets you will find on the market today! It comes with a new sturdy snap-shut carrying case, with a very protective soft foam lining inside the case that holds and protects the otoscope, handle, forceps, expandable speculum and the 3 sizes of specula! This is a BRAND NEW, Chrome plated brass Otoscope Set with handle, operating otoscope head, micro operating forceps, expandable specula, a 4mm Veterinary speculum, a 6mm Veterinary speculum and a 7mm Veterinary speculum. 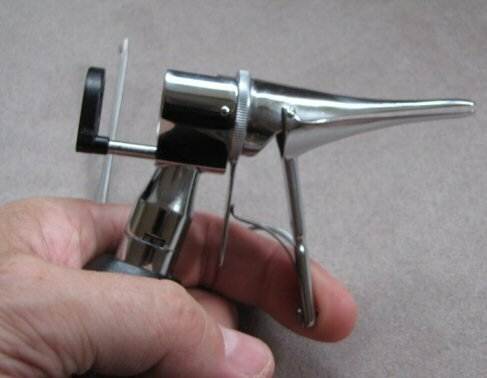 PLEASE NOTE that this is the very latest model 3.25 VOLT operating veterinary otoscope. 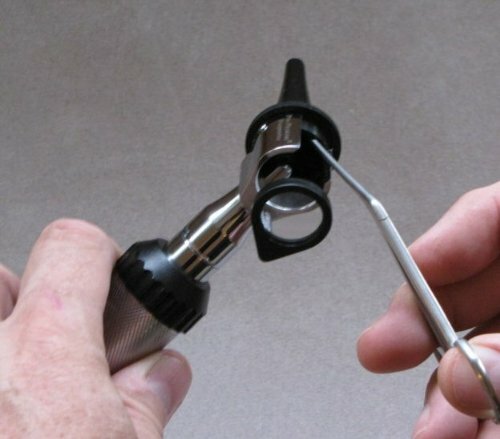 The heart of any otoscope is in it's lens. 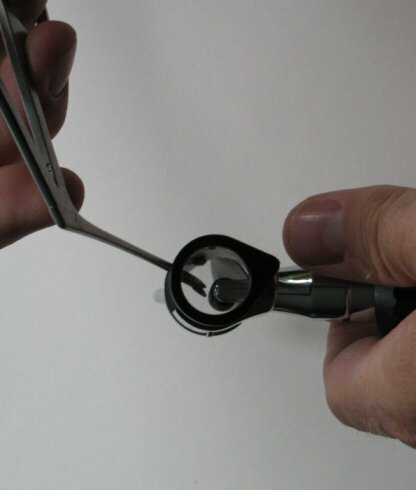 Like all finer quality otoscopes ours comes with a glass lens. It is the excellent überlegen brand with a 5X MAGNIFICATION and added focal length to accommodate the longer veterinary specula. The lens is scratch resistant and of optical quality. It swivels easily out of the way for foreign body removal. 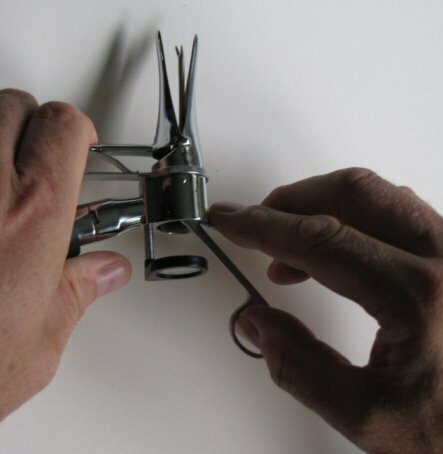 The kit includes a micro operating forceps that works really well in combination with the expandable speculum to remove foxtails and chick weeds. The handle uses 2 "C" alkaline batteries, so you get a very bright light. It will also accept re-chargeables if you so wish to use them. The advanced design otoscope head attaches to the handle with a Luer-Lock mount EXACTLY LIKE A WELCH ALLYN OTOSCOPE SET that is guaranteed to never wear out.